Outdoor fireplaces are quickly becoming a backyard staple for many homeowners. Enjoying the warm summer nights and extending time outside during cooler months is a more frequent occurrence thanks to various outdoor fireplace units. They can do much more than provide you with just a glowing fire. Many offer a BBQ grill as a standard or optional accessory. One such fireplace is the Mirage Stone Outdoor Fireplace. This fireplace features an interlocking construction that allows for quick and easy assembly. In about an hour, you can assemble your unit without the need of mortar or metal fasteners. The only tool you need is a level. Using new technology in material sciences, this fireplace is comprised of strong, heat-dissipating stone that avoids the problems usually associated with concrete and cement-type mixes when they are exposed to extreme temperatures. 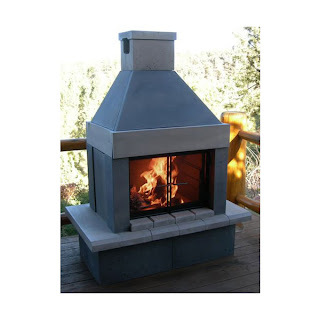 The standard burn choice of wood or charcoal comes with a BBQ grill with adjustable height, while the optional gas log set is available for natural or propane gas. Included in the complete set are 18" gas logs, gas pipe, gas line connector, safety pilot valve, valve key, ashes, sand, and lava rock. When purchasing a gas burning unit, remember that the installation of a natural gas line requires a licensed mechanical contractor in most states. The various color choices of this durable outdoor unit are pewter, red, sandstone, tan, taupe, and black/gray or gray/black combo- giving plenty of selection for creating a beautiful addition to your backyard living area. The powder coated steel door system ensures a long lasting finish without cracking, chipping or peeling. Along with the standard style door handle, are four decorative screen handle options available in - cactus, horses, trees, and birds. This unit is also available as the Mirage Stone See-Through Outdoor Fireplace with all four sides being open. It has one other color option to choose from as well. Either of these outdoor fireplaces are a great choice to enhance your freedom of the great outdoors.